Coloured papers were reserved for the highest echelons of the coconut hierarchy, the "general staff" or dollar values. The $1, $2 and $5 each had its operational compass. The black and red on blue looks psychedelic, almost radioactive—not an inappropriate maverick image for the "youngest" of the senior officers. The $5, in the position of command, exudes the refinement of two shades of green and the authority of a splendid shade of red. The $2 (not shown) shares the colours of the $5 but on white paper, signifying its lieutenant-general status. For some reason, coloured paper was coated at Samuel Jones' facility in the scenic village of Tillycoulty northwest of Edinburgh in Scotland, while white paper was coated in London (Glazer 1997). 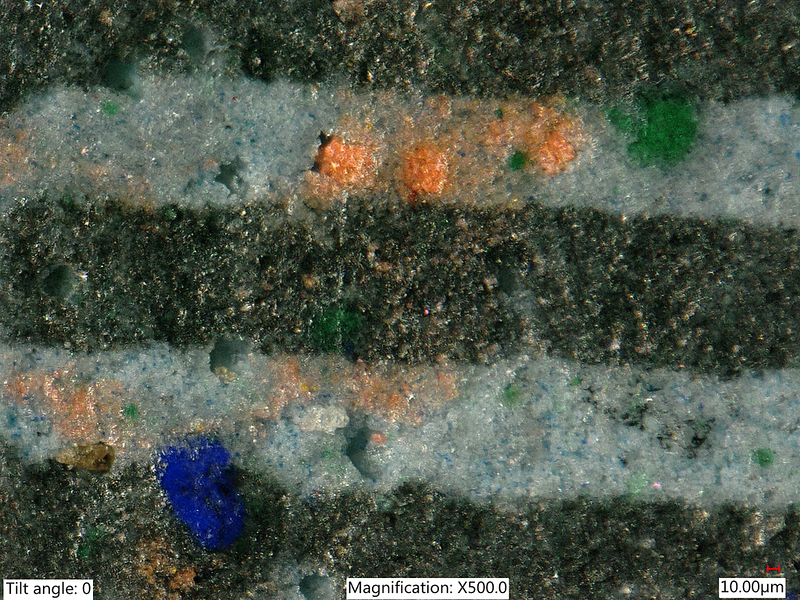 The coating on this sample of blue paper harbours residual particles of blue and green colouring (Fernbank 2013). I have seen green paper carrying blue particles as well. These pigment particles are good samples for spectroscopy, as they are relatively free of impurities. The orange paste is from a forged Okugawa seal. The focus-stacked image was generated using a Keyence industrial microscope configured with reflected partial annular illumination to provide shadow information. I used Raman spectroscopy to analyze the chemical compounds in blue and green particles (Lin & Lim 2019). Each stamp was placed on a microscope slide with two coverslips taped to the slide and pressing down on both ends of the stamp but leaving the Raman sampling area uncovered. This stops the stamp from curling out of focus during data acquisition but leaves it undamaged. Pigment particles were centred and focused through a 50× objective lens and targeted with a 532 nm laser. Laser power was less than 10 μW at the surface of the stamp, which is two orders of magnitude lower than that used by Araki et al. (2016) at the same wavelength and caused no visible damage to the stamp. A diffraction grating of 1800 grooves mm−1 gave high-resolution Raman spectra. The exposure time of the Raman signal detector was set to 10 seconds. The pigment particle was scanned five times and the five spectra were added up to boost the signal-to-noise ratio. The resulting cumulative spectrum (raw data) was baseline-corrected using the ModPoly algorithm (Lieber & Mahadevan-Jansen 2003), meaning that the average slope of the background signal was adjusted to zero. This aids visual comparison with reference spectra. The Raman intensities in each spectrum were normalised to (0,1) to aid comparison. 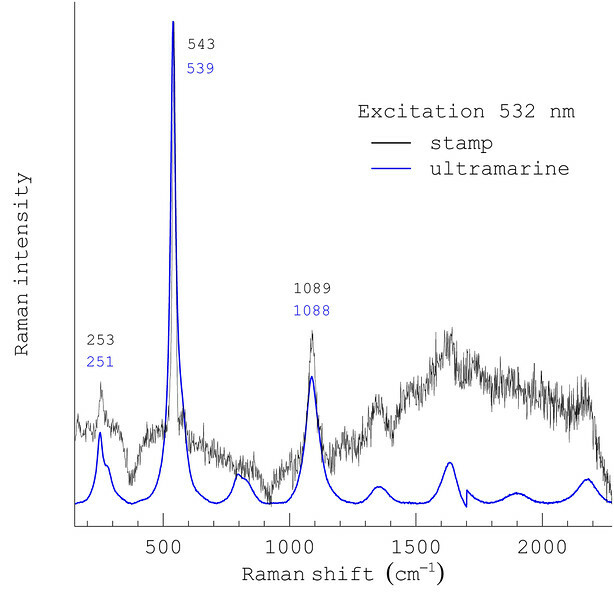 The linear-baseline-corrected Raman spectrum from one of the blue pigment particles on blue paper shows that it contains ultramarine (Na8–10Al6Si6O24S2–4). The three highest peaks in the reference spectrum are matched closely in shape and relative height by the spectrum from the stamp. The vertical jump in the reference spectrum at 1700 cm−1 is an artifact from the combined plotting of spectra collected separately, and can be ignored. Two other blue pigment particles on the stamp produced similar spectra (not shown). Ultramarine was originally made from the precious stone lapis lazuli, which was mined in Afghanistan and cost more than gold. Renaissance painters reserved it for the robes of the Virgin Mary. A cheap synthetic alternative was finally invented during the Industrial Revolution. In 1962, French artist Yves Klein invented a shade he called International Klein Blue, which uses a large amount of ultramarine. I saw the original work at the Tate Modern in London. 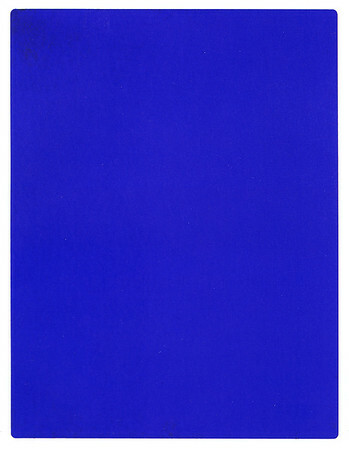 In Klein’s words, “Blue has no dimensions, it is beyond dimensions”. Ultramarine particles have been used elsewhere as optical brighteners, for example on Hawaiian Missionaries (Chaplin et al. 2002). 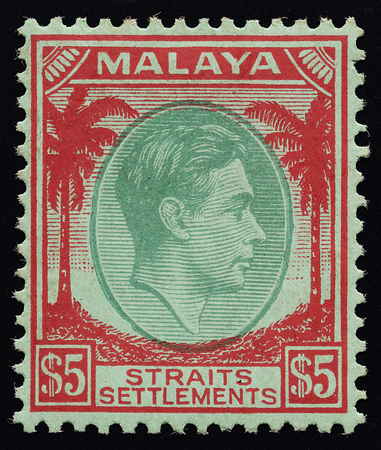 This is unlikely to be the case on the Malayan stamps, as the particles are too large and far apart. I have not seen blue particles on the white papers of the coconut definitives. It also leaves the green and yellow particles on blue paper unexplained. Interestingly, Glazer (1997) reports that Prussian blue was used in the paper coating for the Bermuda KGVI issue of 1941, rather than the ultramarine identified here. Perhaps different pigments were used for different batches of paper. In order to get the desired mix of qualities (texture, opacity, print quality, durability et cetera) in a given stamp, an intricate choreography of myriad chemicals is involved (see Glazer 2004). 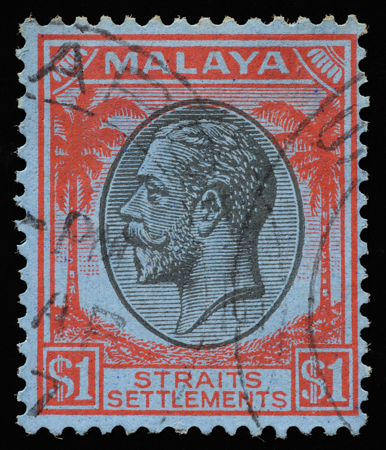 Some pigments might be more suitable than others for a specific scenario, and the chemical composition is known to vary widely even among British colonial stamps (see Glazer 2004). 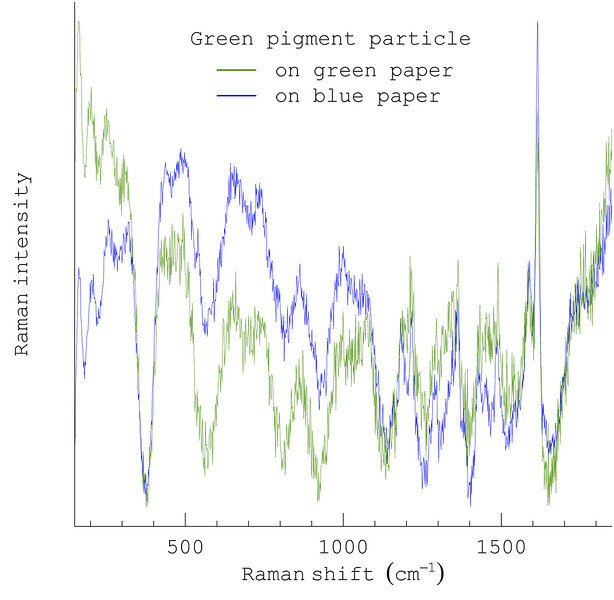 Quadratic-baseline-corrected Raman spectra of two green pigment particles, one on blue paper and the other on green paper. These show that they are the same pigment or same mix of pigments. I could not identify the substances used here. Based on the available reference spectra, I eliminated the following: chrome green (mixture of Prussian blue and yellow lead (II) chromate), phthalocyanine green, emerald green and copper citrate (see Eremin et al. 2008). Various blue and yellow pigments, which could have been combined to make green, also did not match. I was unable to get distinct Raman peaks directly from either the blue or the green paper coating, as the pigment was too diffuse and was probably masked by the many other chemical additives in the coating. The colours of the coatings are probably from the same pigments as the particles tested, but there are reasons why they might be different. For example, Prussian blue being used for one printing, such as the Bermuda issue mentioned earlier, may end up as contaminant particles in another printing that was only meant to be coloured with ultramarine. The story is further complicated by the fact that the colouring for the coating and the colouring for the underlying paper were applied separately. It is not clear for a given paper colour whether the pigments used in the paper and in the coating were the same. Nevertheless, one reasonable assumption is that the particles are not the result of contamination from inks used to print the stamps. This is because the coating and printing were done in different places by different firms. Coloured coatings were applied by Samuel Jones & Co. in Tillycoulty in Scotland (Glazer 1997), while the printing was done by De La Rue in London. I am grateful to Lim Kim Yong, Sow Chorng Haur and the Department of Physics at the National University of Singapore for the facilities and help that made this research possible.